Here at Kranich’s Jewelers, we are committed to providing couples with both classic and unique engagement rings. By seeking out the most innovative jewelry lines by some of the most well-respected jewelry designers in the industry, our team is able to find engagement rings as timeless and as special as the love you share with your partner. While some designers offer multiple jewelry selections, others specialize solely in wedding and engagement rings – such as our line of rings by the revered Barry Verragio. We are proud to offer this globally celebrated line in our store, and are excited about the endless options for personalizing each ring to perfection in your eyes. Barry Verragio is an expert in his field, and one of the most innovative fine jewelry designers in the world. He began his career as a jeweler, whose passion for the artistry of jewelry led him to the esteemed Fashion Institute of Technology in New York City. It was there that he fell in love with the elegance of ring design. Now, with over 25 years of designing some of the most unique wedding and engagement rings in the world, you can rest assured that a Verragio ring is a ring she will love. Each and every ring in his ever-evolving collection is inspired by the undeniable and often effortless beauty of women. Everything from his unique shapes, layered approach, innovative design elements – to his multiple options for personalizing each ring for the bride to be – is designed to be elegant, classic, sophisticated and beautiful. He never designs a ring for the sake of designing a ring, and goes back to the drawing board if a design is not as unique as the bridge he envisions; the beautiful woman whose finger it will be gracing. A Verragio ring is designed with multiple layers. While the layers of each ring, or each of his current collection of rings, is unique, each layer can be personalized so that the bride can truly experience the brand’s motto to “make it yours.” The current five collections are the Parisian, Venetian, Insignia, Classic and Couture. Each layer of the ring can be personalized to allow the bride to express her personal sense of style. While most rings are designed with only one precious metal, Verragio engagement rings are unique because each layer can be made with a combination of White Gold, Rose Gold, Yellow Gold or Platinum. In other words, the design of the band is highlighted by contrasting metals. The combination of metals allows you to create a ring with endless possibilities, and that doesn’t even include the options in diamonds and gemstones. Not every ring has each of these layers – and don’t worry about understanding what each layer means. Your trusted Kranich’s jeweler will walk you through all of the distinct differences that make your engagement ring special. Verragio engagement ring bands differ from most. While most designers offer an intricate setting with a plain band, Verragio dazzles with both the band and the setting. Not only is every wedding ring and engagement band designed in multiple precious metals, but each band is designed to be stunning from every angle. While most bands are fairly simple, a Verragio band is a full-circle design. It looks beautiful from the top, either side and even from the bottom of the ring when your hand is facing up. Since the gemstones and intricate 360-degree design encompasses the entire band, the rings can be resized up to 1 ½ sizes with Verragio’s patented sizing system – without ever being cut. What would a wedding or engagement ring be without a stunning diamond? As if the endless options in the wedding band aren’t enough, you still need to consider the diamond. Each Verragio ring features a focal gemstone in one of the classic cuts – round, square, oval, princess or pear. While the setting is predetermined, you can, of course, choose from varying quality and colors of diamonds. Study up on the 4 C’s before you begin shopping, so that you can truly understand the differences in Cut, Color, Clarity, and Carat Weight. Should You Bring Your Bride-to-Be Ring Shopping? Verragio rings are for unique brides, or fiancés who desire something unique for their bride-to-be. While a more standard design has enough options to choose from, the endless options in Verragio rings can make shopping feel a bit overwhelming. Since each ring is a custom design, and therefore does not qualify for a standard refund or exchange, it might be best to ensure your bride has a bit of input – but the choice is of course always up to you. You could even bring her browsing one day to simply gauge a few of her likes and dislikes. Your wedding ring is a symbol of your lasting love, so selecting the perfect ring is a must. Rings are also a significant investment, so you want to invest time and attention in designing a ring that your bride will cherish for years to come. We know there are a lot of important decisions to make when shopping for the perfect ring, which is why Kranich’s Jewelers is committed to making the process as fun, exciting and easy as possible. This entry was posted in Engagement Ring, Verragio and tagged engagement, engagement ring, Verragio on November 14, 2016 by jzerbee. For more on any specific piece offered at Kranich’s Jewelers, visit Kranichs.com or call 888.944.4575 and we will be happy to help you. This entry was posted in Verragio and tagged Designer Engagement Rings, designer wedding rings, diamond engagement rings, diamond wedding rings, Verragio, verragio collection, verragio engagement rings, verragio venetian, verragio venetian collection, verragio wedding rings on July 28, 2010 by admin. It’s been quite a week here at Kranich’s Jewelers and we are happy to announce the addition of the new Venetian Collection to our selection of Verragio jewelry. The new Venetian Collection is having a grand unveiling this weekend at JCK Las Vegas and thanks to another of our favorite designers, we now offer this new line to the Kranich’s customer. For a little more on this beautiful design, here is an excerpt from the Verragio blog describing the new line. With Barry Verragio’s latest Venetian collection, Verragio will offer engagement rings and wedding band designs that go beyond the typical engagement ring styling to provide a unique look reminiscent of fine Italian lace. The rings in the Venetian Collection will join Verragio’s Couture, Insignia, Paradiso and Classico Collections as another option to the engagement ring shopper who is looking for a ring style that is transcendent of time. All weekend long, we will be offering unbeatable introductory pricing on every piece on our site. Stop by http://www.kranichs.com and have a look for yourself. 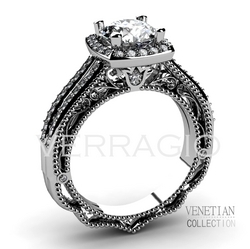 For questions about the Venetian Collection by Verragio or more on any specific piece offered at Kranich’s Jewelers, visit Kranichs.com or call 888.944.4575 and we will be happy to help you. This entry was posted in Verragio and tagged Designer Engagement Rings, designer wedding rings, diamond engagement rings, diamond wedding rings, Verragio, verragio collection, verragio engagement rings, verragio venetian, verragio venetian collection, verragio wedding rings on June 4, 2010 by admin. Would you like a free designer Verragio ring from their upcoming Venetian line? Yeah, I thought you might. Check out this post that originally appeared on PRweb. Verragio, manufacturer of engagement rings and wedding bands, will be giving away 10 engagement rings to 10 of its fans on Facebook beginning March 24th through their newest sweepstakes. New York, NY (PRWEB) March 23, 2010 — Verragio is giving their fans on Facebook another 10 chances to win an 18K gold and diamond engagement ring during a new sweepstakes titled “Ten Verragio Rings, Ten Weeks, Ten Winners.” Each engagement ring that will be given away will be from Verragio’s new Venetian Collection beginning March 24, 2010. With Barry Verragio’s latest Venetian collection, Verragio will offerengagement ring and wedding band designs that go beyond the typical engagement ring styling to provide a unique look reminiscent of fine Italian lace. The rings in the Venetian Collection will join Verragio’s Couture, Insignia, Paradiso and Classico Collections as another option to the engagement ring shopper who is looking for a ring style that is transcendent of time. “Giving away 10 engagement rings to our loyal Verragio fan base is not only a token of appreciation for their support,” says Barry Verragio, “But also a great way to introduce them to the newest Verragio Collection before they are even available in retail establishments.” The Venetian Collection will be available in authorized retail establishments beginning May 2010. To become eligible for Verragio’s engagement ring giveaway, you must become a Fan of Verragio on Facebook. Specific rules of the contest will be posted on March 23, 2010. Ten winners will be selected at random and announced on the official Verragio Fan Page. Verragio specializes in engagement rings and wedding bands of the highest quality and beauty. Verragio is the creator of the Lumino Setting, a revolutionary setting technique that reveals all sides of a diamond, opening up every facet to light. Available in platinum, gold and palladium, the Verragio Collections can be seen only in carefully selected, authorized retail establishments located in the United States and Canada. For questions about the latest line from Verragio or more on any specific piece offered at Kranich’s Jewelers, visit Kranichs.com or call 888.944.4575 and we will be happy to help you. This entry was posted in Diamonds, Verragio and tagged Diamonds, kranichs jewelers, venetian, Verragio, verragio engagement rings on March 25, 2010 by admin. I know it’s a few days old, but for those who haven’t seen it yet, the team over at Verragio asked all of their Facebook fans to help them name their new designer line due out this Spring. Here is an excerpt from the official release. New York, NY (PRWEB) February 17, 2010 — Without an official name assigned to the new collection of engagement rings and wedding bands, Verragio provided a sneak-peek of the new designs to a select group of fine jewelry establishments at the invitation-only Centurion Jewelry Show in Tucson, Arizona earlier this month. “The distinctive styling combined with our unique approach to accentuate the side profiles of the rings have been particularly appreciated by the jewelry retailers at the show,” says Barry Verragio. New Evermore Collection by Verragio When it came to naming the new collection, Verragio reached out to its large fan base on Facebook. After a week of voting, Verragio fans decided on “EVERMORE” as the name of the new collection, pulling in over a 75% preference in votes. With Barry Verragio’s latest Evermore Collection, Verragio will offer engagement ring and wedding band designs that go beyond the typical engagement ring, to provide a unique styling to those who appreciate the superb craftsmanship and inspired artistry in the details. The Evermore Collection of engagement rings will join Verragio’s other distinct collections such as Couture, Insignia, Classico and Paradiso. Verragio is officially launching the new Evermore Collection in the spring. For questions about the new collection by Verragio or for more on any specific piece offered at Kranich’s Jewelers, visit Kranichs.com or call 888.944.4575 and we will be happy to help you. 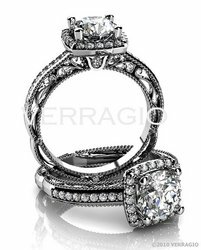 This entry was posted in Press Releases, Verragio and tagged designer ring, Evermore, Facebook jewelry, kranichs jewelers, Verragio on February 23, 2010 by admin. So we got buried here in central Pennsylvania with a ton of snow so we’re going to have a sale. Check it out! For more on any specific piece from Kranich’s Jewelers, visit Kranichs.com or call 888.944.4575 and we will be happy to help you. This entry was posted in Diamonds, Everlon Diamond Knot Collection and tagged Everlon, kranichs jewelers, Ritani, Simon G., snow sale, Verragio on February 8, 2010 by admin.